Hooked on Plants: Ethan, you were the first one to go vegan, and you weren’t exactly soft or silent about it to Michael (haha). Eventually Michael caught on! Can you expand on this? 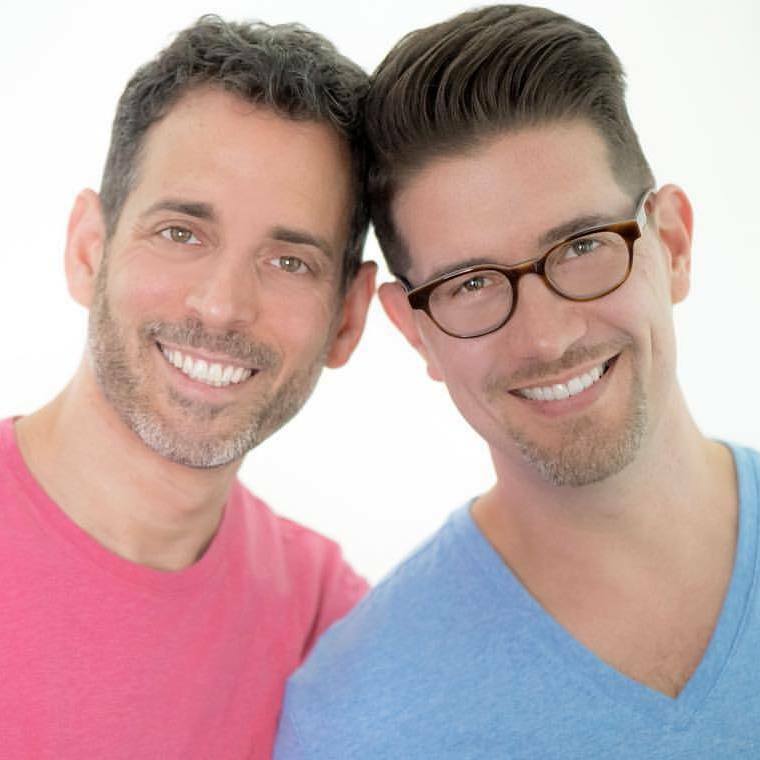 Why and how did you both go vegan? Ethan: I initially went vegetarian for health reasons. At 38 years old I was already taking medication for high cholesterol and was 40 pounds over weight. I saw being vegetarian as way to lose weight and get my cholesterol under control. I then read The Face on Your Plate: The Truth About Food by Jeffrey Masson and learned the horrors of factory farming. I knew that I could not continue to eat any animal products or benefit in any way from any kind of animal abuse. Ethically, being vegan was the only logical choice, and after 5 months of being vegetarian, on Thanksgiving 2009 we went to Michael’s family for the traditional meal, but I didn’t eat anything. When we came home, I prepared the Tofurky Thanksgiving Feast and realized that if I could do Thanksgiving as a vegan, I could be vegan all the time. Michael: During this time, I was working out of the house and doing most of the cooking. I had to learn how to make food that Ethan would eat and that I would like. So, even though I wasn’t even considering being vegan, I was learning how to cook vegan food. Also during this time, Ethan, like most people when they first learn the horrors of factory farming, became full on vegangelical and would continually ask me questions like, “how is your plate of murder?” ….Rather than getting me to go vegan, this had the opposite effect. I can be very stubborn and wasn’t about to be bullied into doing something. Thankfully, Ethan soon realized that this approach wasn’t working and accepted the fact that he was the one who changed and it wasn’t fair to expect me to change as well. As soon as Ethan stopped pushing, space was created that allowed me to walk forward. After seeing Kathy Freston on Oprah talk about “leaning in to veganism” and being “flexitarian,” I started doing Meatless Mondays. I eventually added in Tofu Tuesdays, Wegetable Wednedays, Tempeh Thursdays, etc. I didn’t say a word to Ethan about what I was doing, but as soon as I completed a full 7 days vegan, I looked at Ethan and said, “It’s been a full week, I am vegan now.” I then of course went through my own vegangelical phase and found myself doing the exact same things Ethan did. Luckily, I soon stopped. 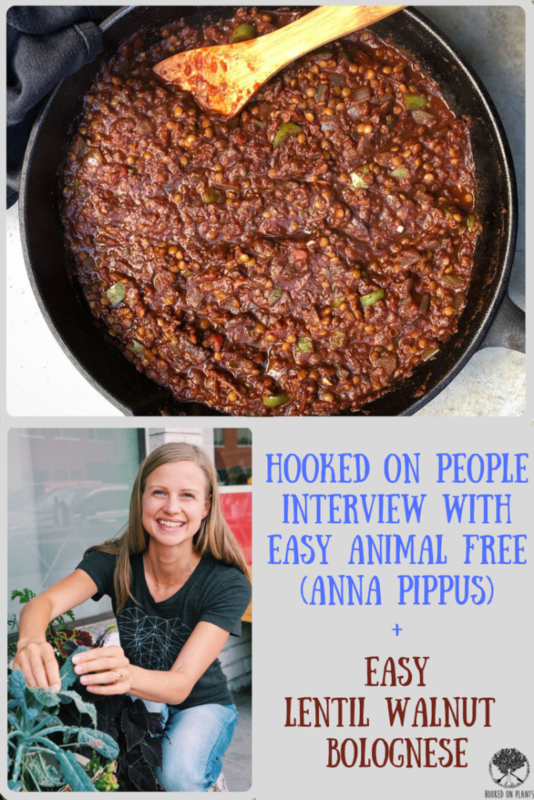 HOP: What are your tips for talking to non-vegan family members? Ethan: My best advice is to accept that you might not necessarily be able change them. Just like you are asking for them to accept you and your choice to live vegan, it is important to understand that they may not be in a space where they can receive the same information that you did, much less integrate it or act on it. Often, it is hardest for our closest friends and family to receive this information from us because our relationships are steeped in lots of history and baggage. It is always important to share your truth with the people you love and you should never tolerate relationships where you are ridiculed, teased or not accepted because of the ethical choices you make, because that cuts at the trust and mutual respect which is at the core of any healthy relationship. At the same time, respect goes both ways. 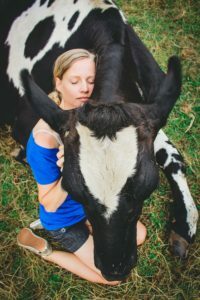 Even though it might be difficult for us to never truly respect our loved one’s choice to not personally embrace a vegan ethic, it’s important to separate that from respecting them as individuals and respecting their right to make their own choices, even choices with which we strongly disagree. In my experience, when you come at folks without an agenda of “getting them to go vegan” it’s far more likely that they actually will. 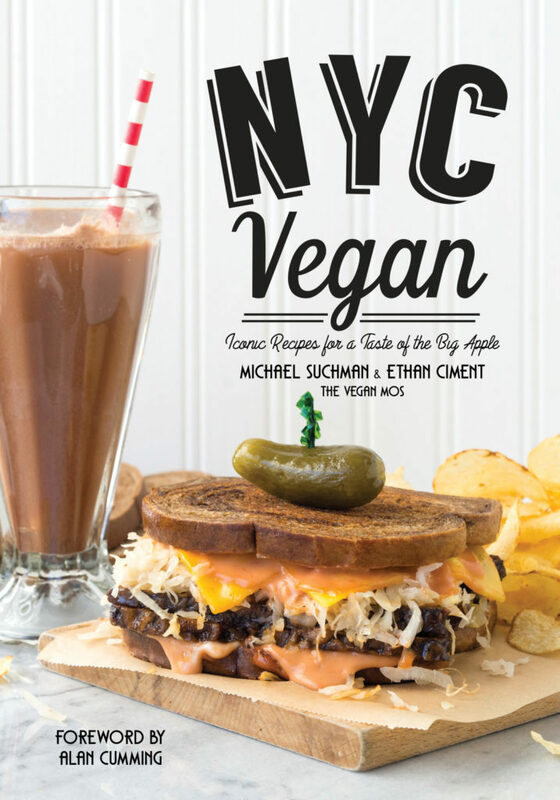 HOP: The Vegan Mos NYC Vegan cookbook is so drool-worthy and packed with old time comfort-food faves! Can you tell us what ‘Vegan Mos’ stands of and how it started? Vegan Mos: The “Mos” in our name is short for homos. Our friends Dan and Mike already had The Gay Vegans, so we decided to use vegan as the adjective to modify Mos. In the 90’s in the LGBT community, using the term “mo” became a way of referring to one another “oh, he’s a mo,” so we decided to reclaim it. We began Vegan Mos as a way of sharing recipes for delicious, homemade vegan food. We wanted to show people that going vegan did not mean giving up any of the flavours we loved. We also wanted to highlight the intersection of LGBT rights and animal rights. We wanted to help people see that speciesism is no different than homophobia – both stem from a fictitious belief that one group of beings is superior to another and therefore can oppress the perceived lesser one. 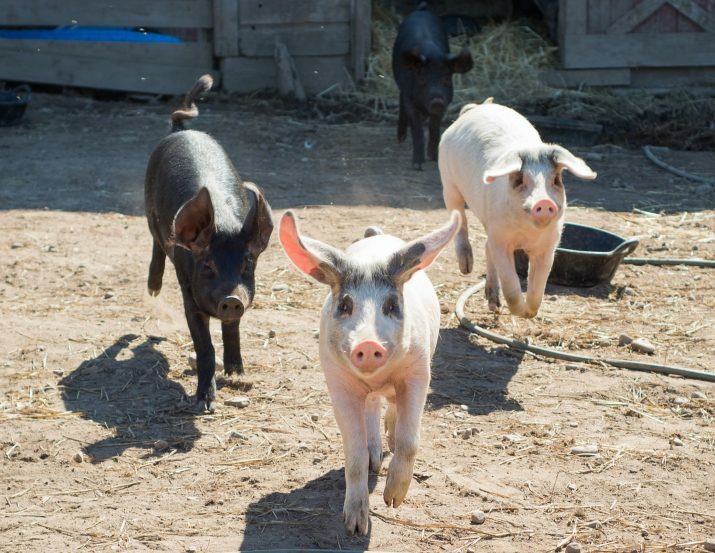 HOP: Can you tell us one of the most life changing moments you have had on a farm sanctuary? 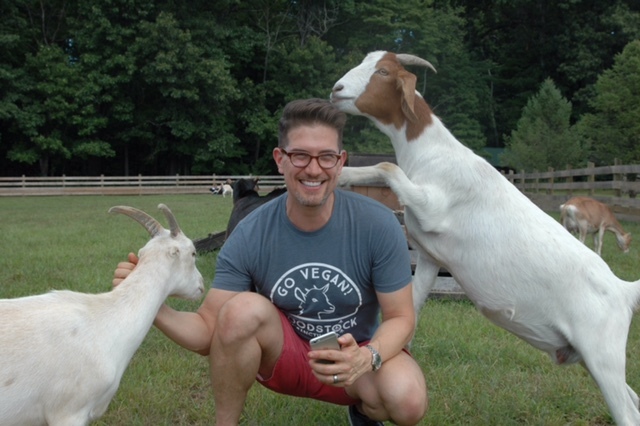 Ethan: I remember when The Tiniest Herd was rescued at Woodstock Farm Sanctuary back in 2016 and the first time I went up and met all the tiny baby goats (like many folks, I can get a little obsessed with the cuteness overload from baby goat videos). When I got to meet all of these babies and watch them with their young mothers, I had my first “Ah-ha” moment about how special this truly was: here were Mothers who got to keep their babies. That just doesn’t happen to the overwhelming majority of farmed animals out there. It really hit me right then and there: when we support industries that use animals for food or some other human purpose, we’re actually destroying families. It was such a special experience to witness these cute babies playing around us with their equally adorable young Mamas who were keeping a watchful eye on them, occasionally disciplining them as needed. I thought, “this is how it’s supposed to be.” That experience infused my already deeply-rooted animal rights activism with a deeper layer of commitment: to keeping families from being separated, whether they are animal families or human families. 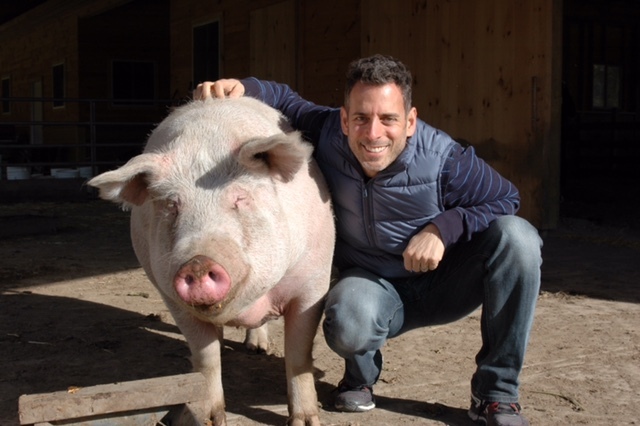 Michael: It was when I first got to meet a piglet at Woodstock Farm Sanctuary named Mishka. Ethan named him Mishka, after me. Mishka was my name in Russian class and when my cousin Karen learned that, she began calling me that, and still does to this day (I won’t say how many decades later). At Woodstock, they don’t like to use the same names for different residents to avoid any confusion when talking about the animals. As there already was a Mike there (even though I never go by Mike, they didn’t want to risk confusion between Mike and Michael), Ethan chose to use Mishka. Mishka and his family (3 brothers, his sister, and his mother) were rescued from a horrible situation of neglect. Sadly one of his brother’s passed away, but Mishka will get to live his life safe and happy with his family. Mishka was the littlest of the bunch and they were not sure he would survive, but he did. This is much like my start in life having been born as a premie and no one knew if I would survive. When I finally got to meet my namesake I was overwhelmed with emotions I began to cry. I will never forget that moment. To know that this little pig is getting the life that so few farm animals will ever get and the fact that he was named was truly remarkable. It was this bittersweet experience of joy for this family and sadness for all the other pigs, and really all the animals, that will never get to live free from harm with their families. HOP: What are your top 3 tips for people out there who want to go vegan? Take it one meal at a time. Don’t worry about what you are going to do on Thanksgiving, or about your birthday cake, or any other far-off meal. Shifting your focus from yourself to the animals you are saving really helps. No animal product tastes as good as saving that animal’s life. Instead of focusing on what’s “missing” from your plate, see that empty space as an opportunity to discover new foods. Try wheatberries, quinoa, amaranth or barley if you haven’t tried them. Maybe you could try Anasazi or Fava beans? Ever try a broccolini? What about Romanesco? 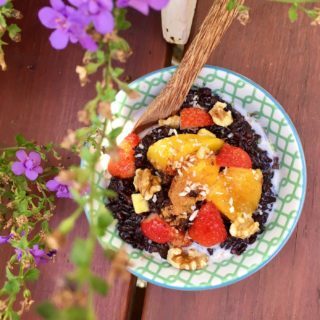 There are so many amazingly delicious, unique and nutrient-dense foods out there. We just need to open ourselves up to trying them. Ethan: When I can remember in the middle of my day to practice mindfulness and focus on my gratitude it shifts my mood immediately and lifts me up. It’s super easy in our current sociopolitical climate to feel threatened and overwhelmed if you’re an LGBT person (or any other minority for that matter.) Sometimes I’ll just stop and think, “You’re breathing… and it’s easy and painless” and I shift my focus and awareness there and just go with that and it immediately de-stresses me and reconnects me to the innate joy and peace that’s always there, but that is often covered up. It is something that I can do anywhere, anytime and radically increases my capacity to feel joy during everyday moments and when doing otherwise mundane activities. 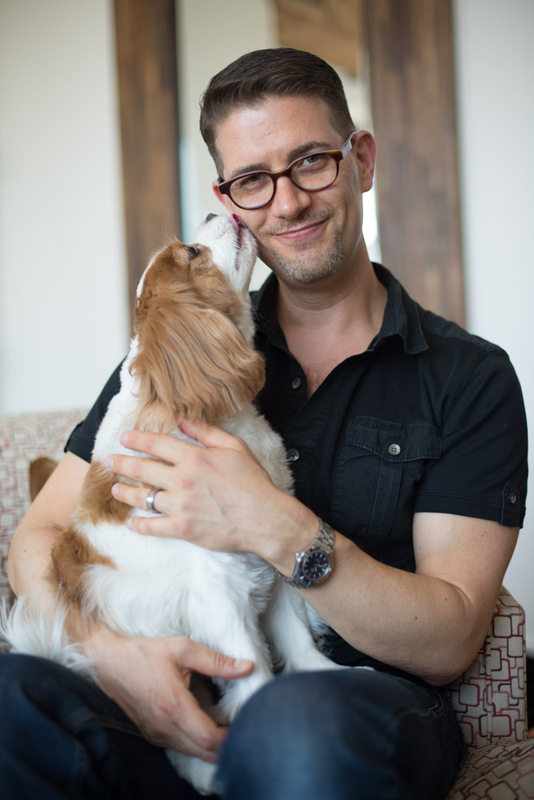 Michael: Spending time with our dogs Riley and Charlie gives me so much joy. There is nothing as wonderful as the love of a companion animal. Also, I am a TV junkie, so sitting on the couch a being able to lose myself in a good TV show is wonderful. HOP: Where is the next place you’ll be for people to come meet up with you? Vegan Mos: Our next scheduled public appearance will at the Hudson Valley Vegfest on either November 3 or 4. 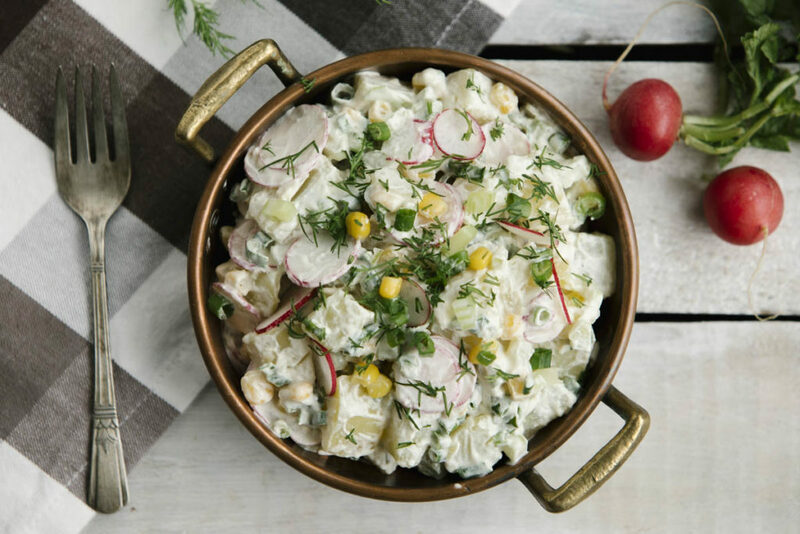 HOP: Let us in on your favourite recipe from your cookbook! 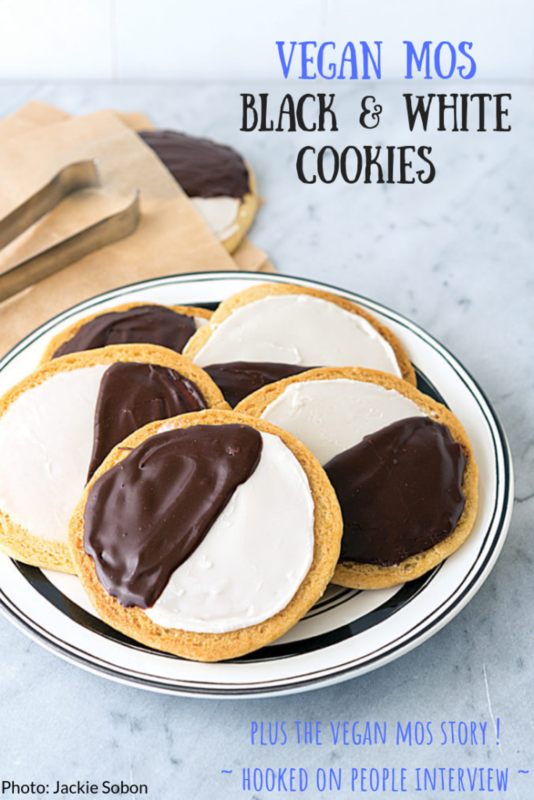 Thanks to a famous episode of Seinfeld, the black and white cookie, once only known to New Yorkers, garnered national attention. In that episode, Jerry used the black and white as a metaphor for racial harmony. Although called a cookie, these treats are actually made from a stiff cake batter and baked free-form on a cookie sheet. 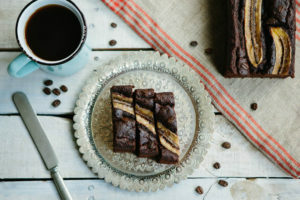 Once found only in bakeries, today the black and white can be found in almost every grocery store and bodega in New York. Scoop the dough, ¼ cup at a time, onto the prepared baking sheets, spacing the scoops 3 inches apart. Flatten them slightly with your hands (keep your hands wet to prevent the dough from sticking). Allow room between the scoops as the cookies will spread as they bake. While the cookies are cooling, make the icing. In a large mixing bowl, combine the confectioners’ sugar, boiling water, and vanilla. Mix well to get a spreadable icing. Add a little more water, if needed. Using an offset spatula, spread a thin layer of icing onto the flat side, the former bottom, of each cookie. Return the cookies to the wire rack to dry. You should have about ½ cup of icing left. Tag me or the Vegan Mos if you make this! 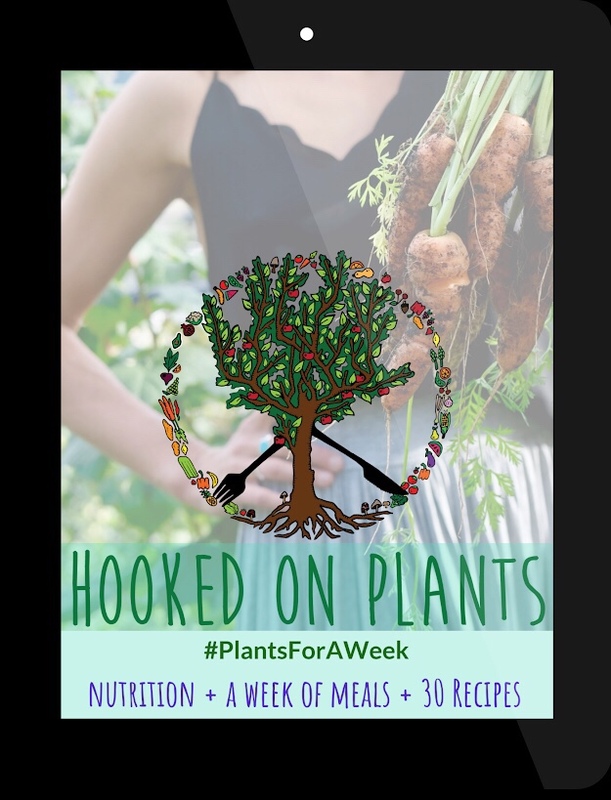 (@hookedonplants @veganmos on instagram)! This week’s email is all about the super inspiring new documentary Running For Good. Let’s get into the interview with… What inspired you to start Big City Hippies? In December 2012, I had a Brain Haemorrhage/Stroke, which put my work & life on hold. For over 2 years, I was committed to serious rehab, and Big City Hippies was started as my creative outlet. 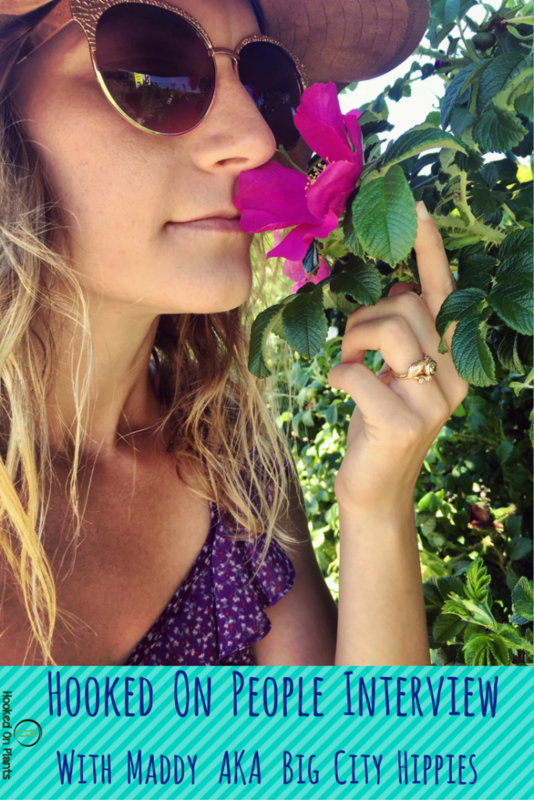 I wanted a place to share my values, ideals, information, and perspective on all the facets of my personality and lifestyle. My sister, Penelope (Penelope Sloan Design) helped me with the name and encouraged me to “just start it”. It’s still a work in progress, and post-stroke me is committed to maintaining my own health & wellness, so Big City Hippies isn’t always a priority. If anyone in Vancouver resonates with my perspective and wants to get involved, contact me! Big City Hippies is meant to be a collective! Tell us in a nutshell what Big City Hippies stands for! Big City Living, Hippie Ideals! It’s the intersection of sustainability and wellness, because #SustainabilityIsWellness. Currently, it’s a social media and blog platform to educate, promote, and inspire others on Eco-Health Living in the city. You’re always up to date with the most recent environmental happenings. What are you most hopeful and excited about at the moment? The new GreeNDP Government in BC. I am hopeful that some concrete steps will be taken now that they have the “majority”. I am hopeful that the Kinder Morgan pipeline will be shut down, that the Site C Dam will be shut down (and arable farmland restored), that clean energy will take precedent, that environmental protection will become much stronger, and that our MPs will put the pressure on Prime Minister Justin Trudeau to keep his word & campaign promises. The list is pretty endless! I’m also pretty excited about the advancements in science connecting nature and health/wellness. Even though this is innate wisdom, this type of research data is needed to sway policy makers & businesses in the right direction to make decisions that nurture our Mind,Body & Soul along with Mother Earth. Also, for in depth databases, reports, and scorecards on topics such as food, farming, toxins, and more, I follow The Environmental Working Group (EWG) and The Cornucopia Institute. They are both US-based, but their information is often very pertinent to Canada, since we live & trade so closely. What are 3 things you can’t live without in the morning? I just started the Instagram @joybundling. Joy Bundling is purposeful pleasure: bundles of joy, for you, by you. It is creating intentional space for self love & self care. 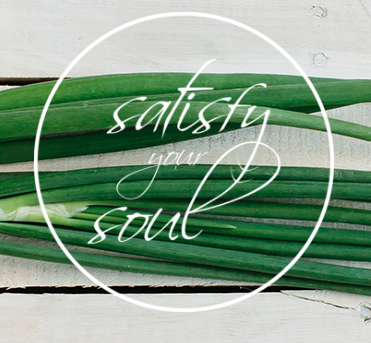 It’s doing a few things that bring you joy with intention + thought behind it. It’s elevating everyday routines and moments into euphoric states; maximizing pleasure, while reducing pain and apathy. This will be crowd-sourced by out global community and collected on the instagram page – follow along! 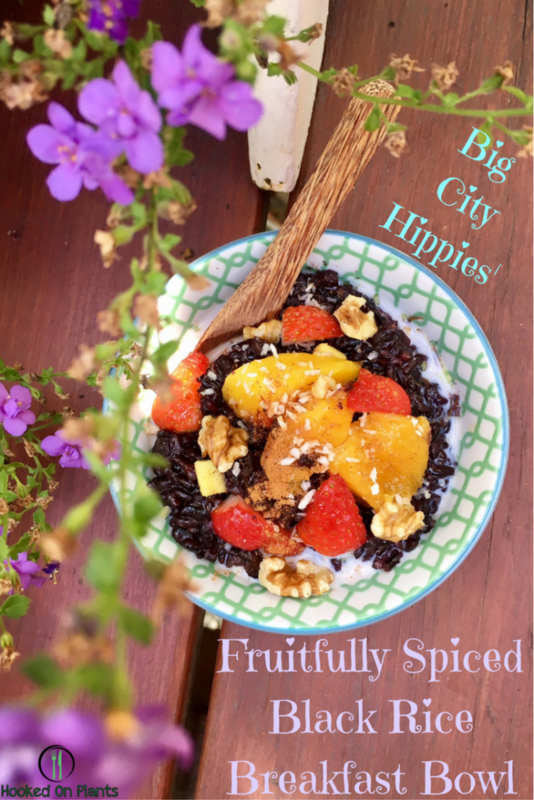 A hearty, creative breakfast idea with black rice, spice and everything nice. Soak the rice overnight (cover with fresh water), rinse, and drain, then cook in ¾ can of coconut milk (reserve the remaining ¼ of can for topping) and ½ cup of water (soaked rice needs less liquid to cook it - start with the coconut milk, add a ½ cup of water and see how far that gets you). Cook with ginger, spices, and coconut oil in the pot, and add diced mango (ours was frozen organic mango chunks) halfway through to infuse that fruity flavour (we just placed it on top of the rice and let it "steam" itself thaw with the lid on). If using fresh, simply stir in, but reserve some for topping! Cook till the rice is al dente (a little chewy), which should be about 35-45 minutes. Stir it a few times, and see if you need to add more water. If you add too much, don't worry, you can drain some off or just leave it as additional "sauce" - it'll still be creamy & coconutty). Once cooked (about 35-45 minutes), stir in other ingredients like the chia seeds. Serve in your favourite bowl, and top with additional fruit, shredded coconut, nuts, and cinnamon. Pour your reserved coconut milk on top, or add your favourite milk instead. 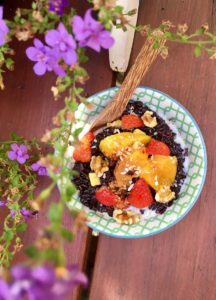 *This recipe is very flexible, with the nutty rice and sweet coconut being the base to add whatever flavours you want. Get creative and add any healthy doodads or spices you have in your fridge and pantry! A masala spice mix (usually referred to as Chai) would be a phenomenal flavour option. Use any seasonal fruit available! *Double the recipe so you have breakfast for a few days (add water when reheating to re-constitute the creaminess)! Use local, seasonal, organic fruit (peaches and apricots would be amazing) for the best flavour and nutritional profile! Shop at your neighbourhood farmers market for an amazing selection of seasonal fruit and buy organic to support nature, your health, and the farmers' health. Sign up for weekly resources, tips, nutrition fun and recipes! 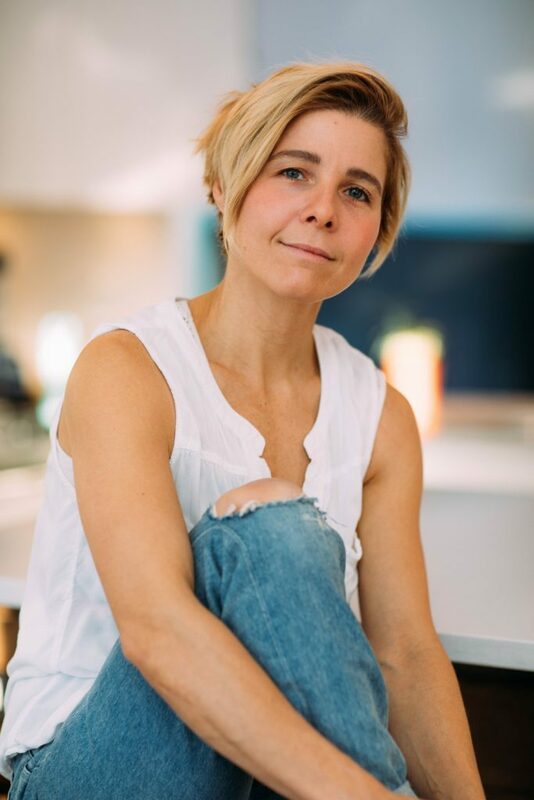 Agathe Mathieu is the chef and owner of the North Vancouver raw, vegan and organic Café by Tao. Just stepping into this café and you are overcome with a feeling of health and well-being. 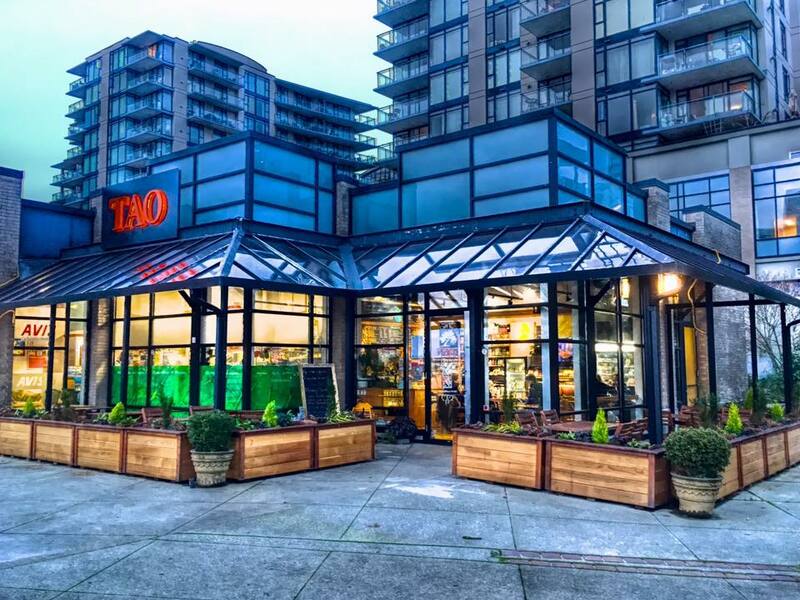 Next time you’re in North Van, definitely give yourself a bit of extra time to pop by their beautiful, new location overlooking Lonsdale Quay. 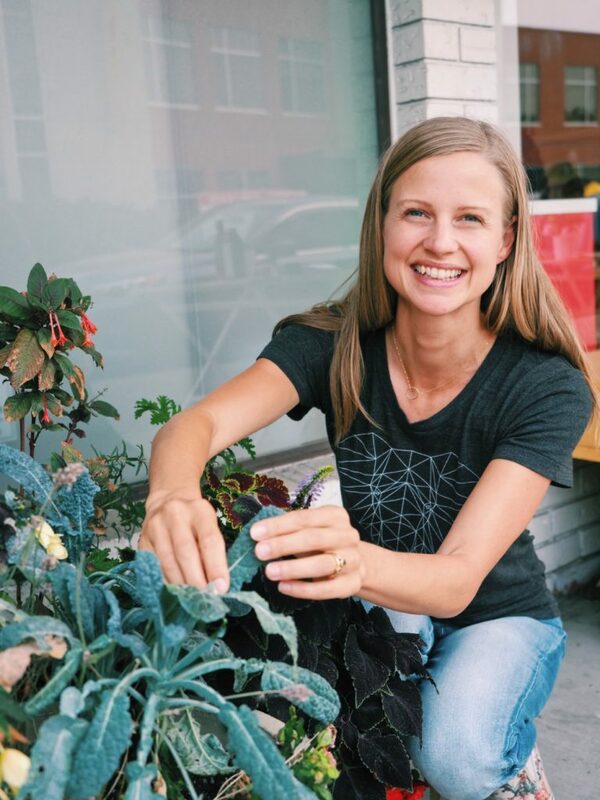 Agathe is raw vegan, she has studied raw food at Living Light Culinary Institute, and has owned Café by Tao for 5 years now. 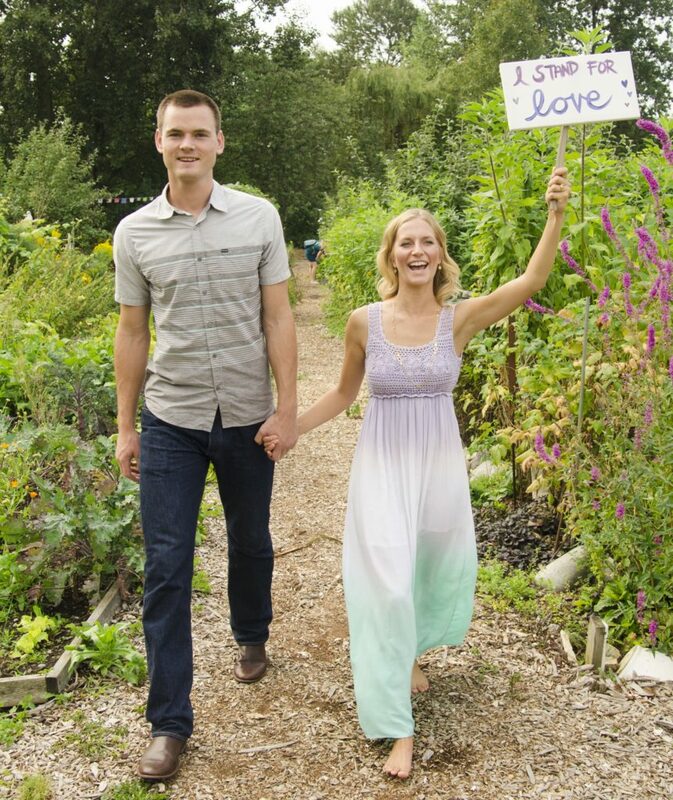 What made you adopt a raw vegan lifestyle? 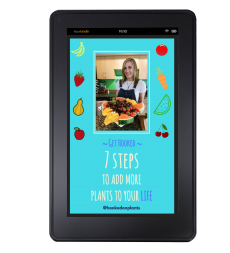 A friend lent me 12 Steps to Raw by Victoria Boutenko and I began eating raw the next day. I have now been eating 100% raw since August 2003! What differences have you seen in yourself since going vegan? 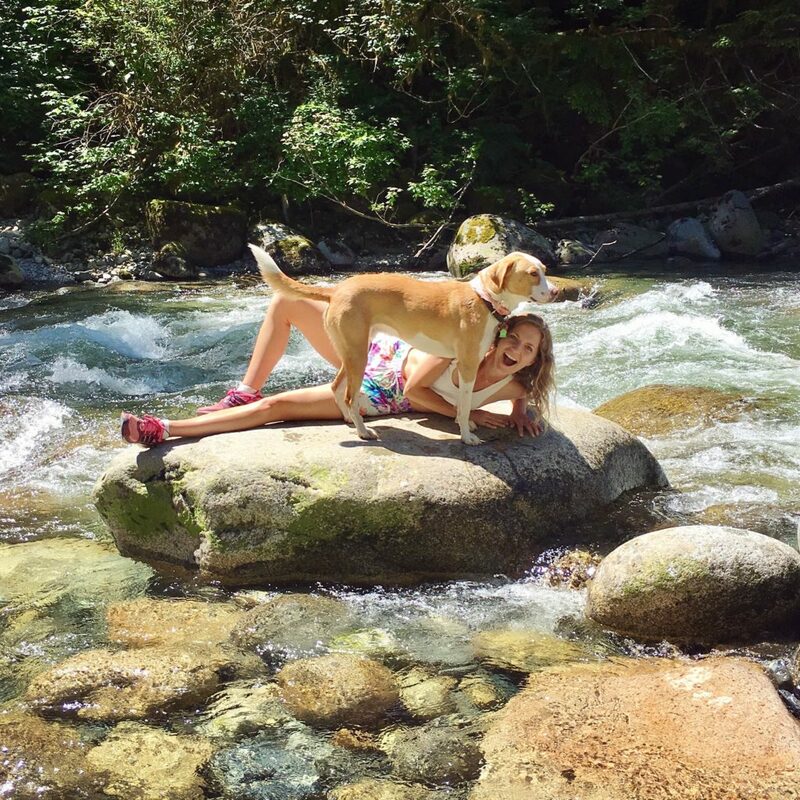 · my energy level soared and I still have a lot of energy today! How did Café by Tao start!? I started first with selling some items wholesale: kale chips, vegan cheesecakes, veggie burger patties, falafel patties, crackers, etc. One thing lead to another, and in March 2012, I opened Café by Tao. You’ve moved to a beautiful new location in North Van! This must mean Tao is doing well 🙂 Have you noticed people becoming more curious about the vegan lifestyle and the foods you create? I have definitely seen more interest in the vegan or plant-based lifestyle now than when I first began eating this way. People are more open to trying new foods and there is more emphasis now on adding more plant-based foods to your diet. 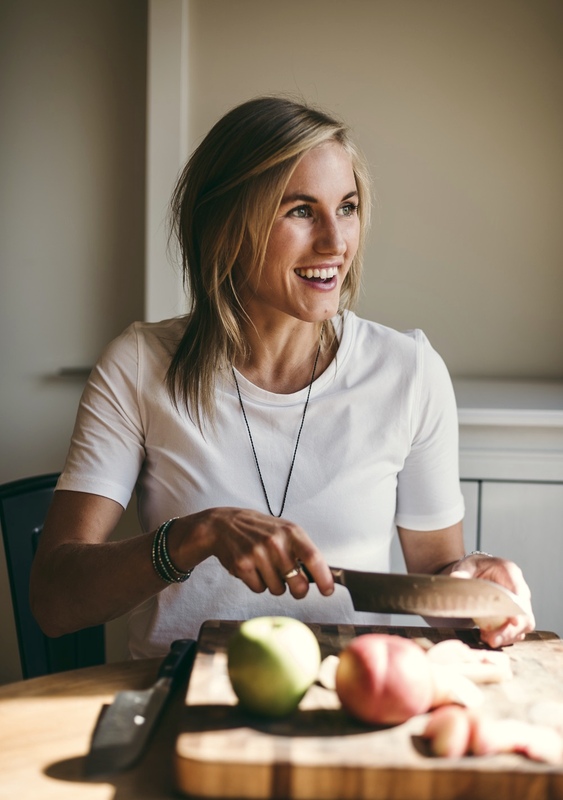 How long have you been a raw vegan chef? 5 years officially with the opening of the café. In 2007, I took a 3 week course at Living Light Institute. Being a single mother of three, I came back and continued the learning in my kitchen. My children were my teachers really telling me if a dish was fantastic or not ;o) Great critics! What are the 3 (or 5) reasons you tell people to go vegan? 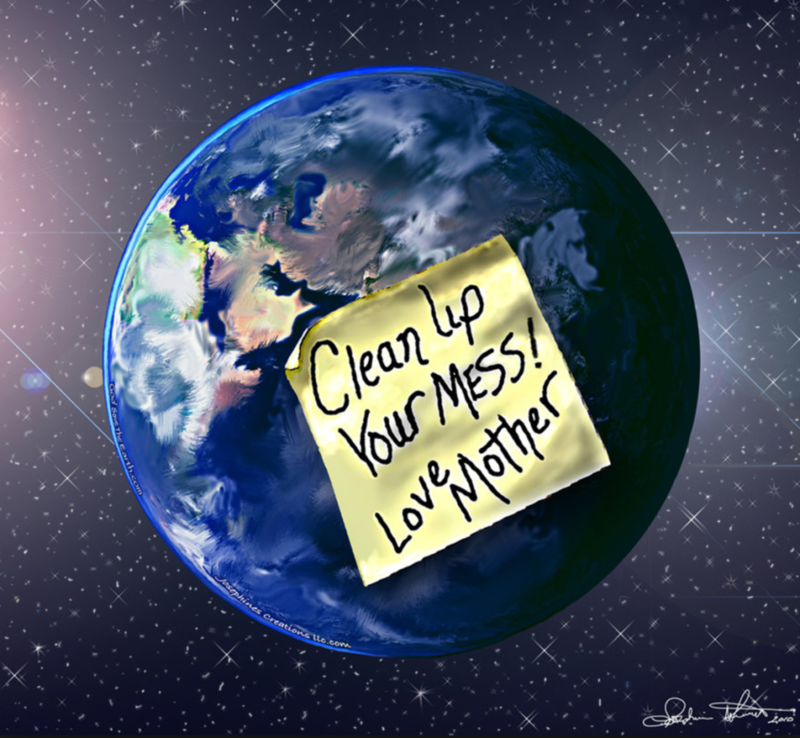 For our health, for our environment, for the animals, to create a better future for our children and our planet. 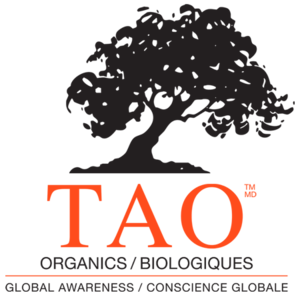 What would you like people to know about Tao ? What is your mission? 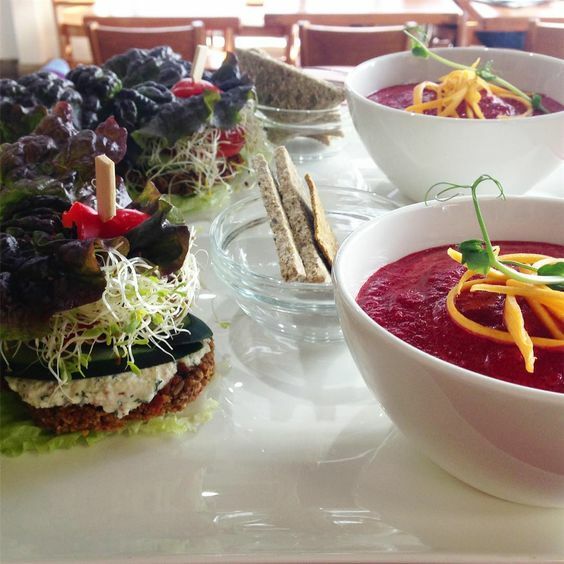 At Tao one discovers how delicious plant-based diet can be, how easy it is to prepare, feel younger and energized! Our mission at Tao is to provide a healthy option to our community and to encourage people to include more plant-based foods in their diet. 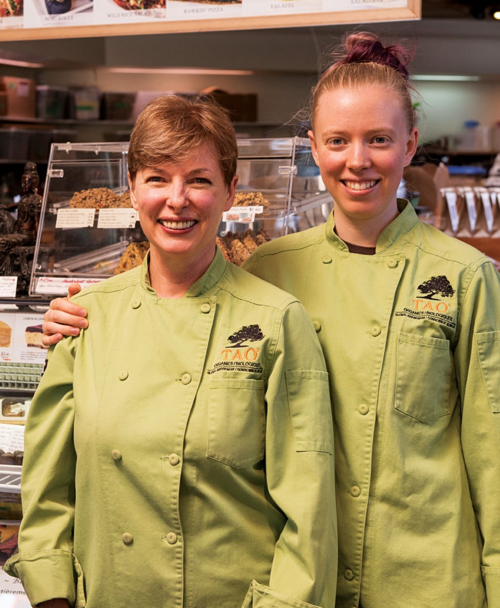 Our vision is to teach “ Health and Business Training” to open ones’ own organic plant-based café restaurant in their community. How clever of Mother Earth to put the medicine in our food! 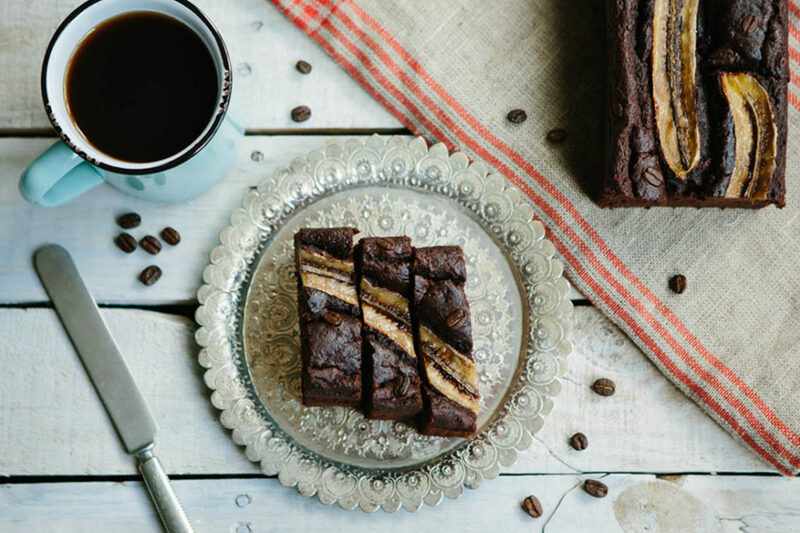 This flavourful vegan cake is free of wheat, dairy and refined sugar. It’s also made with nutrient-dense ingredients that would make your mother proud. All you need is a food processor, a blender, and a 6” spring form pan. 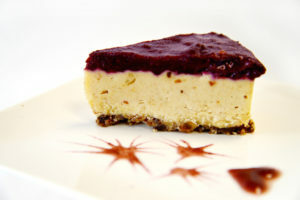 Pour the lemon filling on top of the crust and refrigerate while you make the blueberry coulis. Make blueberry coulis: Mix dates and blueberries in your blender until creamy. Pour blueberry coulis on top of lemon filling and freeze for 6 hours, then move to the fridge.